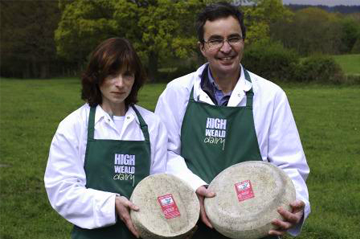 High Weald Dairy cheeses are available to buy from farmers markets and delicatessens across Sussex and beyond. Selected cheeses are also available in some supermarkets. Take a look through the list below to find your closest stockist! Riverford Organic – stocks Duddleswell, Halloumi, Sussex Slipcote (plain). and Brighton Blue. Tel. 01803 762 059. Abel and Cole – stocks Duddleswell, Halloumi, Sussex Slipcote (garlic & herb). Tel. 08452 626262. 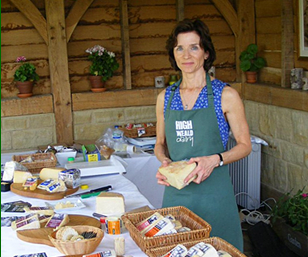 Mr and Mrs Cheese – stocks various High Weald Dairy cheeses. Tel. 01903 891744. Sainsbury’s currently stock our Organic Halloumi, Brighton Blue, Sussex Marble and Chilli Marble in many of their southern deli counters. Co-op stocks much of the High Weald Dairy range in nine stores across Sussex. You’ll find our cheese in the Co-op stores in Yapton, Selsey, East Wittering, Stockbridge Road, Spittlefields, Hove, Wadhurst and both London Road and Junction Road Co-ops in Burgess Hill. Waitrose stocks our Organic St Giles in stores across the South East. Marks & Spencer stocks our Halloumi in selected stores across the UK.